Tashkent's month-long International Jazz Festival wraps up on 8 May. This article provides a brief overview of the festival followed by information about how Uzbek musicians are fusing traditional music with jazz to create their own unique sound. In 2011 UNESCO designated 30 April as International Jazz Day to highlight the role jazz plays in uniting people all over the world. International Jazz Day brings together communities, schools, artists, historians, academics, and music fans all over the world to celebrate and learn about jazz. 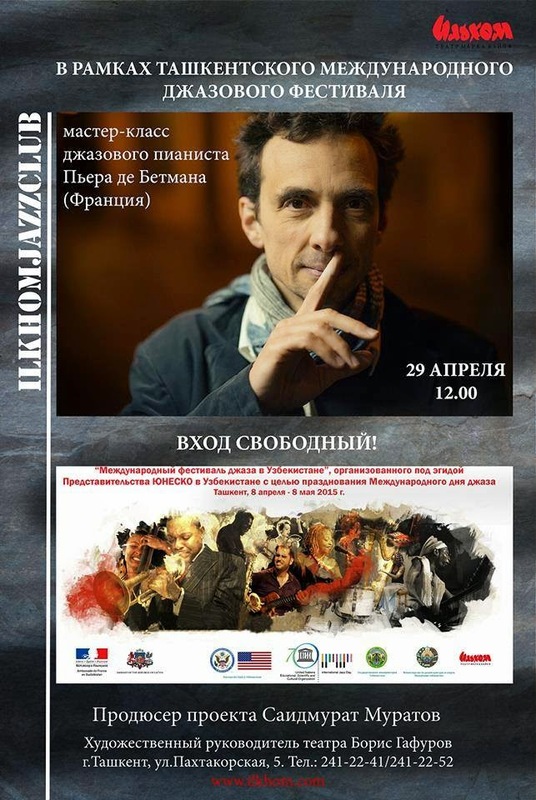 Supported by the US, French, Latvian and Indian embassies, as well as Tashkent's Ilkhom Theatre and UNESCO, the festival included concerts by Uzbek and international musicians, master classes and jam sessions. New York's Ari Roland Jazz Quartet is inspired by jazz from the 1930’s to the 1950’s. The quartet visited Uzbekistan in 2009. This year the quartet held master classes and collaborative creative sessions at the State Conservatory of Uzbekistan as well as the Tashkent Pop and Circus College. India's Sitar Fusion group is led by Pandit Prateek Chaudhuri, considered one of the most outstanding sitar players in India today. The group's performance blended classical Indian tradition on sitar plus percussion drums and keyboard. Pierre de Bethmann is a professor at the Paris Conservatory and laureate and winner of many musical prizes and awards such as Victoire du Jazz 2008 - French instrumental album of the year and the Django Reinhardt Prize 2004. His program included a solo performance, a joint concert with the State Conservatory of Uzbekistan and master classes. Latvian group Xylem TRIO combined piano, saxophone and marimba/ percussion in a wide-ranging, exciting program. The festival provided outstanding collaborative opportunities for Uzbek and foreign musicians. And for fans, free entry to many of the concerts, provided an opportunity to hear great jazz. According to an article Jazz with a Touch of Pilaf by Dengiz Uralov, "The seeds of jazz were planted in Uzbekistan in the 1950s and 1960s via American radio and vinyl records. They continued to grow despite Soviet-era bans and persecution, the emigration of musicians during perestroika, and a widespread ignorance of the form in contemporary Uzbekistan". Uzbekistan's State Jazz Orchestra was formed in 1995 - all the musicians are graduates of the Uzbek State Conservatory of Music. It's a "big band" sound: the repertoire includes jazz pieces by composers such as George Gershwin, Duke Ellington, as well as works of popular Uzbek composers such as Ikram Akbarov, and Dilorom Omonullaeva. Jazzirama is one of the most exciting groups in Tashkent today. 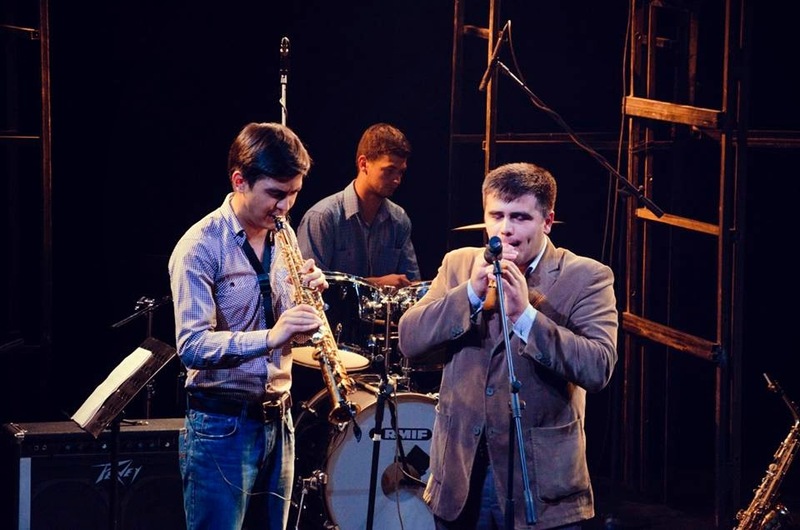 Founded in 2011 by pianist Sanjar Nafikov and saxophonist Saidmurat Muratov, the idea unifying the young musicians was the promotion of Uzbek folk music, its fusion with jazz, progressive rock and other modern styles. 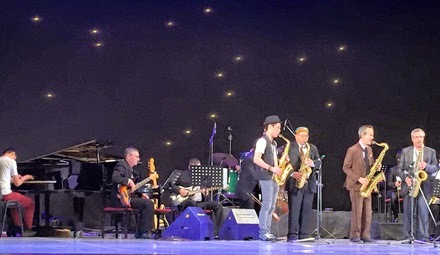 Jazzirama took the Central Asian music scene by storm at their debut in the international jazz festival "Jazz Bishkek Spring" in 2011. The group was awarded the Grand Prix for the best performance in the ethno-jazz category. German composer Moritz Gagern noted "The colors of Uzbek traditional music, instruments, and singing uniquely melts into this language just as the architecture of an old mosque melts into a busy intersection with cars, Soviet-style buildings, and unfinished skyscrapers somewhere in Tashkent. And the level of musicianship is very high..."
Listen to Jazzirama's unique sound. Another dynamic band is Choyxnoa Jazz, headed up by saxophonist Igor Ten. Still students at the Conseravotium of Music these young guys play to sell-out concerts in venues such as Tashkent's Ilkhom Theatre. As well as guitar, saxophone, drums and keyboard, band members play traditional instruments such as duduk, oud and sato. Choyxona Jazz sessions were also highlights of the festival. Where to Hear Jazz in Tashkent? The Ilkhom Theatre hosts a monthly Jazz Club - tickets sell fast. For details about those concerts as well as jazz at the State Conseravotium of Music please refer the post "What's On in Tashkent". And music lovers all over the country hope that the festival will become a regular event in Tashkent's calendar.